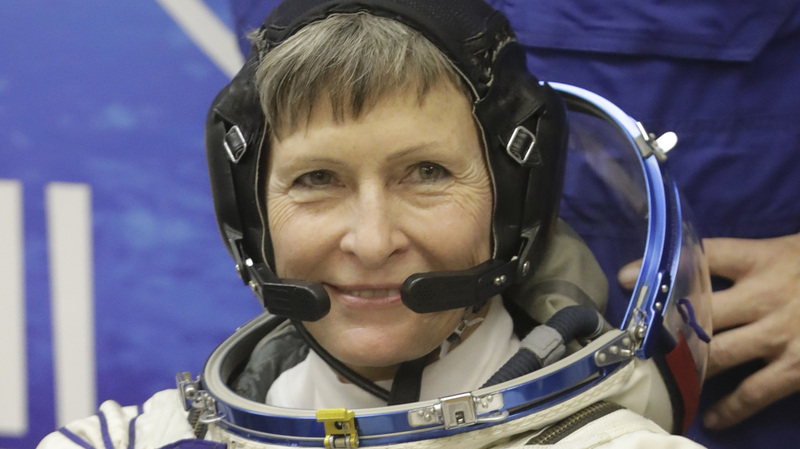 At 56, Peggy Whitson Becomes Oldest Female Astronaut : The Two-Way On the mission, she's projected to once again become the U.S. astronaut with the most time spent in orbit. U.S. astronaut Peggy Whitson gestures before the launch of the Soyuz MS-03 spaceship to the International Space Station on Thursday. NASA astronaut Peggy Whitson arrived at the International Space Station this weekend, making her the oldest woman in space at age 56. On the mission, she's projected to once again become the U.S. astronaut with the most time spent in orbit. This is Whitson's third mission on the space station; she'll soon become its commander for the second time. Collectively, she's spent more than a year of her life in space. When Whitson lands back on Earth in spring of 2017, she'll have amassed more time in orbit than Jeff Williams, who set a new U.S. mark in September with total off-planet time of 534 days. That's if the return date of Whitson's Soyuz MS-03 craft remains in May, as reported by Space.com. A previous NASA release had placed the return date in late April. "The Iowa native completed two six-month tours of duty aboard the station for Expedition 5 in 2002, and as the station commander for Expedition 16 in 2008. She has accumulated 377 days in space between the two missions, the most for any U.S. woman at the time of her return to Earth. Whitson has also performed six spacewalks, totaling 39 hours and 46 minutes." Whitson, who holds a doctorate in biochemistry, will turn 57 during her current ISS mission.